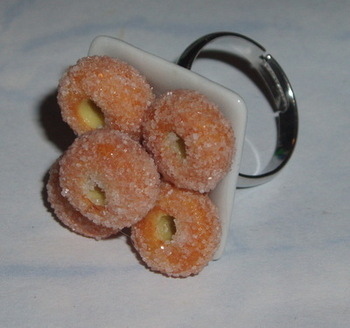 Donut Ring, Bright and punky, Handmade Donuts Dusted with Sugar on a Plate Ring securely attached to an adjustable silver plated base. There are 5 sugar coated donuts on each plate. Each Sugar Dusted Doughnut is individually hand made using fimo clay. Totally unique and so in fashion. The Ring with all the Holes. As worn by Marina Diamandis and Kara Tointon.